The many new uses for discarded cargo containers now include camping structures. Looking out the bus window on her commute into work at King County Parks’ downtown Seattle headquarters, Sujata Goel kept noticing more and more shipping containers piling up on the outskirts of the city’s sprawling port complex. Meanwhile, news stories started surfacing about how our trade deficit with China was leading to a glut of empty containers at West Coast ports, and how some enterprising architects were dreaming up ways to breathe new life into these rugged if forlorn 20-by-40-foot-long metal boxes. When her parks department cohorts began discussing problems they were having with vandalism at the camping yurts the county operates at Tolt-MacDonald Park, a lightbulb went off above Goel’s head. Why not repurpose shipping containers as industrial-strength camping structures? Crazy as the idea seemed—even to Goel when she daydreamed it up three years ago—it’s about to become reality. 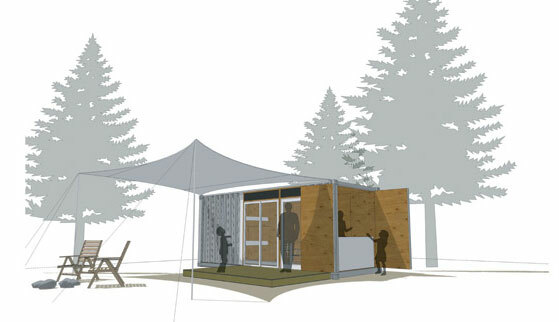 The first container, a 24-footer donated by shipping giant Matson, is currently being worked over in King County Parks’ Renton workshop and— campers, rejoice!—will be available for nightly rental at Tolt-MacDonald Park, near Carnation, beginning this summer. Accomplishing this hasn’t been easy. The first round of funding to develop a prototype container fell through in 2009. Then, last year, Goel convinced a colleague from King County Solid Waste to get that agency’s GreenTools program (which works to reduce construction waste in King County) behind the project. The GreenTools connection provided not only much-needed funding, but also high standards for sustainability. To that end, Goel and company decided the best way to go green would be to solicit ideas from the local architectural design community, given its predilection for sustainable building techniques and materials. So they made the design of the first container into an open competition last August, created a design spec outlining overall needs, and assembled a panel of sustainability experts and green-minded local celebs (including Pearl Jam’s Stone Gossard and nature photographer Art Wolfe) to review the designs and pick a winner. While the competition attracted 13 different submissions from all over the world, in the end, Seattle’s own HyBrid Architecture and Assembly came out on top with its innovative, inexpensive, über-green “RE-Tain” design, featuring prefab exposed fir interior wall panels, recycled finishes and furnishings, and a large tarp that forms an indoor/outdoor vestibule off the tricked-out container’s front door. At one end, a sleeping nook with a queen-size bunk bed means each container can sleep four, while a multipurpose mess cabinet—recycled, natch—on the other end opens out to the fresh air to maximize airflow and the indoor/outdoor nature of the experience. The design is flexible enough to accommodate different reclaimed doors, windows and kitchen cabinets, depending on what’s available; King County Parks has a plethora of reclaimed materials from teardowns of newly acquired properties. And, of course, the containers can be locked down tight if menacing weather is on the horizon or to deter vandals in the off-season. To some, it won’t come as a surprise that HyBrid, which has been repurposing shipping containers for retail, office and residential use up and down the West Coast for the better part of a decade, won the competition. During the groundbreaking for the Olympic Sculpture Park in the summer of 2005, Seattleites who visited the temporary video information terminal—a “theater in a box,” as HyBrid principal and cofounder Joel Egan calls it—experienced the firm’s so-called “cargotecture.” Another local and more permanent example is a critically acclaimed 7,200-square-foot office/retail building project in Georgetown (on the 600 block of S Lucille Street) that HyBrid crafted out of a dozen different containers. It is the largest container-based building in the western U.S.
Now, campers lucky enough to score a reservation will get to try out cargotecture for themselves at Tolt-MacDonald Park. If all goes well with this first installation, Goel will spearhead the search for another site somewhere in King County Parks’ vast expanse of properties that could accommodate a new campground custom designed for a half-dozen or more camping containers. Can’t wait until summer to check out a rehabbed, repurposed cargo container? They’ve been popping up all over our area in useful incarnations. In Georgetown, HyBrid Architecture and Assembly (hybridarc.com) has constructed two buildings out of 12 shipping containers; it’s the largest cargo container project on the West Coast. The buildings, located in the 600 block of S Lucille Street, are currently for sale. Gawk at a Starbucks made from four used shipping containers (shown at left) in Tukwila. The new drive-through (and walk-up) is on East Marginal Way S at the southwest end of Boeing Field. And coming soon, cargo containers could bring new meaning to the term “mini-mart”; Seattle-based Stockbox Grocers (stockboxgrocers.com) is hoping to open several miniature grocery stores in parking lots around Seattle. Check out a sleek prototype shelter created from a shipping container on the Washington coast (left) by Seattle designer and general contractor Hartman Kable at surfshackbox.com. Come summer, when King County Parks’ first container is finally ready to receive guests at Tolt-MacDonald Park (NE 40th Street in Carnation), you can try to reserve a night by calling King County Parks’ camping line at 206.205.5434. Rates aren’t set yet, but will be about $50 per night. The yurts already in place there are also $50 a night and are sometimes booked out a year in advance—so call early and often.